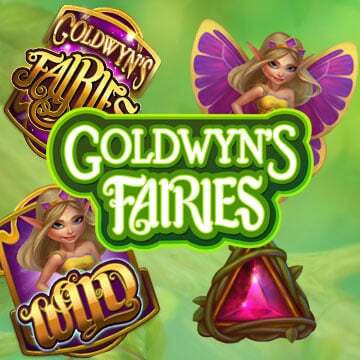 Enjoy the wonders of Goldwyn’s Fairies and the magical forest of riches. Enjoy this amazing slot at any of the Microgaming Casinos, and soar around with the beautiful fairies while mystical music sets the mood on your way to your enchanting winnings. Free Spin symbols can appear anywhere on the 1st, 3rd or 5th reels. This will award you with 10 Free Spins! These will be 9 Free Spins with the Returning Wild feature and 1 Final Free Spin. The initial bet placed to trigger the Free Spins will be carried through to the Free Spins feature. Free Spins cannot be retriggered. You don’t get 1, but 3 amazing Wild symbols that will increase your chances at winning. These amazing Wild symbols substitute any of the symbols except for the Free Spins symbol. The three wild symbols are the Classic Wild symbol, Re-spin Wild symbol and the Free Spin Wild symbol. The Free Spin symbol and the Re-spin symbol can appear anywhere on the reels during the base game except during the Free Spin and Final Free Spin. The classic Wild symbol on the other hand can appear on any reel during the base game, the Final Free Spin and the Final Re-Spin game mode. Another exciting thing about Wild symbols is that the substitution pays the highest possible winning combination on a line according to the paytable. When you land 1 Re-spin symbol on reel 3, you will be awarded with a Returning Wild feature. Any classic Wild present on the reels when Re-spin mode is awarded, will turn into a Returning Wild. The Re-Spin mode continues until no more Re-Spin Wild symbols appear, then a Final Re-Spin is awarded. In the base game, the Re-spin Wild symbol can only appear on reel 3, and it is the only symbol that can appear during the Re-spin mode except the Final Re-spin.